That's a tall order. You're probably feeling a bit overwhelmed and stressed. You probably have a headache. And fatigue. And sleep-deprivation. Maybe you need a doctor. In fact, you do. You need The Healthy Humorist®. And speaking of stress, let's get back to you--the stressed-out meeting planner. Dr. Brad is friendly, organized, and easy to work with--just the prescription you need with everything else you have going on. He'll make you look like a hero! Dr. Brad is unique. (After all, how many physicians do you know who can make you laugh?) 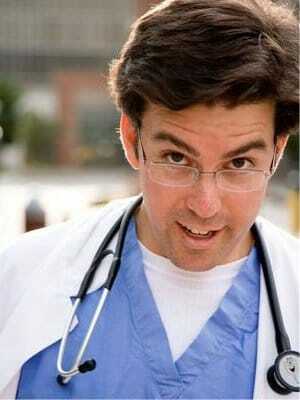 He's been described as Jerry Seinfeld or Ray Romano...with an "MD." Always a fan of standup comedy and improvisation, Brad became a founding member of the SIMPS improv troupe while attending Stanford University. During medical school at the University of Colorado, he frequently performed standup comedy throughout Denver for both live audiences ... and cadavers. He then moved on to the Medical College of Virginia for his residency. He still traverses the country, but he once again lives in Denver, a general practitioner by training who some would say is really a specialist in Healthy Humor™. And while he has NOT been published in the New England Journal of Medicine, he has co-authored the book Humor Me, which features his popular poem of wellness advice. And he has a CD and DVD, too! And some pretty cool T-shirts! Those hotshot academic physicians can't say that! So inject a dose of Healthy Humor™ at your next event. You--and your attendees--will be feeling better in no time! Well, okay, maybe penicillin is better. And aspirin is good, too. Come to think of it, morphine's got to make the list. But laughter is still quite effective at reducing stress, managing pain, and boosting the immune system. In the workplace it can enhance communication, aid creativity, and improve productivity. And when Dr. Brad speaks, it's contagious! Let the Healthy Humorist™ prescribe his creative, inspiring message for your group. He'll outline the benefits of laughter, offer wellness advice, and leave 'em laughing!